G.tecz developed an amazing new concrete material. 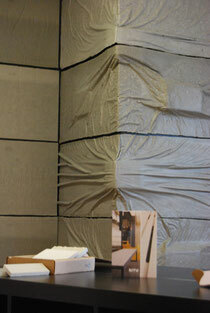 This material can be used for concrete wall-papers, wall cladding, furnitures, art and so on. It's real cement bonded material, based on G.tecz's Quantz technology. We can offer several surface qualities and panel thicknesses (respective tolerances). Also, the look and feel of the material can be influenced. The 3mm panel can be produced regarding your requirements.